The history of reef keeping is replete with examples of reef keepers adapting methods and tools of other disciplines for use in a reef tank. Lighting is the most obvious example – very few of the bulbs we use were designed with reef keeping in mind. Many less obvious examples abound. A resourceful reef keeper probably spends as much time in a hardware store as he does in an aquarium store. One of the undervalued resources available to hobbyists is the boat supply store. Companies like West Marine can provide a wide range of products specifically designed for saltwater use. During a visit to my local West Marine I became curious about bilge pumps. Their reasonable price combined with high volume pumping capabilities intrigued me. I wrote a piece on using bilge pumps for water circulation in a reef tank. I pointed out that while powerheads were a convenient means for generating water circulation, their design created problems when trying to create realistically strong water motion in the average tank. At subsequent presentations at the Ft. Lauderdale MACNA, Monterey Western Marine Conference, and several club meetings I talked about bilge pumps and showed a modification of a pump replacing the impeller with a radio controlled powerboat propeller. Using video tape presentations I showed that replacing the impeller with a propeller created a much broader wave-frontthan the typical powerhead and that much higher water motion energies could be created without the dangerous shearing forces of powerful powerheads. Unfortunately there are several limitations with bilge pumps. They are inexpensive but not particularly well built. They are not designed for continuous use. Finally, most bilge pumps run on 12 volts. Despite these limitations, the article and presentations generated considerable on-line discussion, and a number of hobbyists began experimenting with the modifications. One hobbyist in particular, Jimmy Chen, was intrigued enough with the concept to search for means to overcome the limitations of bilge pumps. His efforts have produced a practical product that dramatically improves on my original concept. The design is a significant improvement over traditional means of creating water motion in a reef tank and warrants the attention of every reef hobbyist. The key component is the Little Giant series of pond pumps. These submersible pumps are similar to bilge pumps in that they are direct drive pumps with an impeller mounted on the end of a shaft. The difference is that the pump runs on house current and is designed for continuous use. Mr. Chen’s modification involves replacing the impeller with a propeller (figure 1). 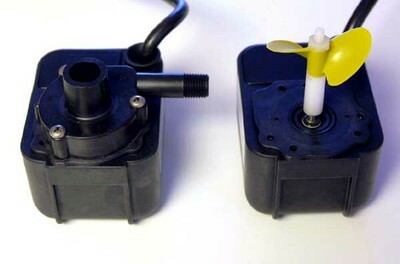 The modification kit sold by Mr. Chen includes the prop and mounting brackets so that the pump can be mounted on the side of the tank like a traditional powerhead (see www.reeftec.com for further details, forthcoming at the time of this writing). Chen has successfully modified the Little Giant PE-1, PE-2, and the PE-2.5. 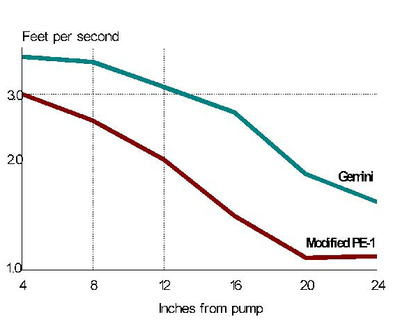 Figure two compares the velocity of the Gemini air-cooled powerhead to the modified PE-1 at increasing distances from the nozzle. Readers of this column know that the Gemini is one of the most powerful powerheads sold to the hobby and it is one that I have frequently recommended. On the face of it, the graph suggests that the Gemini is a much more powerful pump. At each distance the velocity of the water flow from the Gemini is greater than that of the PE-1. Rather than proving the superiority of the Gemini pump, however, the graph shows the limitations of using a velocity meter to measure water motion in a reef tank. Because water flows from the Gemini pump through a fairly narrow nozzle, the velocity of water of a given volume is high. In contrast, the same volume of water flows through a propeller at a slower rate because of the larger cross section of the propeller. 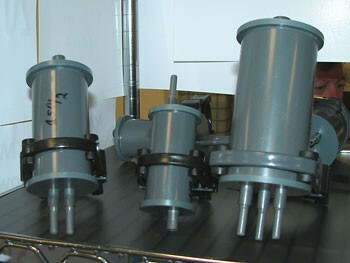 To better determine how the two pumps compare in a reef tank, the modified Little Giant PE-1 pump was mounted fairly close to the surface at the same depth as the output of the Gemini. This is one limitation of a air cooled powerhead. The water is circulated fairly close to the surface. This can give the illusion of good water motion while producing considerably less at depth where it is needed. In my 55 gallon test tank the Gemini generates a modest but reasonable roil (turbulence) at the surface. Most of the flow from the pump moves directly across the tank. At the same depth, the Little Giant prop produces a very high surface wave front across the length of the tank accompanied by considerable splash. This suggests that water flow from the propeller is spreading outwards at a much faster rate than the flow from the Gemini. Figure 3 shows water motion using four different devices. In each case one pump is turned on and then water motion allowed to stabilize. A “typical” position of the test strips is shown. (Even with a continuously running powerhead, there is enough turbulent flow in the tank to change the position of the test strips from time to time, so there is some subjectivity involved in choosing the “typical” view.) For these tests, the Little Giant pumps were mounted about five inches below the surface of the water. The top frame demonstrates the effect of one Otto 2000 running in the forward right hand corner. The second frame is the effect of the Gemini running in the front left corner. The third frame is the PE-1 in the left rear corner, and fourth frame is the PE-2 in the right rear corner. Figure 3. Water motion demonstrated with four different devices. Top from left: first frame, second frame. Bottom from left: third frame, fourth frame. The Otto powerhead is rated at 500 gph and mounted close to the surface gives the illusion of generating a great deal of water motion. As the photo shows, however, the Otto barely moves the test strips. The unidirectional flow is apparent from the fact that the front row of strips is deflecting while the rear row is fairly upright. The greatest flow is at the center of the tank. The strips near the powerhead are stationary because the jet of water is flowing over them. The Gemini in the second frame deflects the test strips very differently. Greatest deflection is at the opposite side of the tank towards the powerhead. Water is bouncing off the opposite side of the tank and deflecting the strips away from the glass. Water motion is lowest nearest the pump. One other interesting observation is the deflection of both rows of test strips. As the water bounces off the side of the tank it spreads towards the rear of the tank. The pattern of deflection of the PE-1 is similar to the Gemini in some respects. The strips furthest from the pump deflect the most and deflect towards the pump. One difference is that the strips closest to the pump are deflecting more with the PE-1 than the Gemini. What is interesting is that the Gemini is rated at 960 gph while the PE-1 is rated at 170 gph. A pump rated at less than 20% the flow of the Gemini appears to be generating as much turbulent flow as the Gemini. The PE-2 in the bottom frame generates the greatest flow nearly flattening the test strips on the opposite side of the tank. Mr. Chen is selling the prepared propeller and mounting bracket that accommodates either the PE-1 or PE-2 as a kit. A hobbyist then buys a pump of his choice and makes the modifications. It took me about 15 minutes to modify each pump. A pair of PE-1 pumps should be more than adequate for a 90 gallon tank and depending on lay-out, a combination of a PE-1 and PE-2 should work in a 90 gallon tank unless the tank has very fine sand. Larger tanks that would normally use a multiple Tunze or Gemini pumps as I did in my 300 gallon tank would want to use at least a pair of modified PE-2 pumps. Any hobbyist who is reasonably adept at cutting and gluing acrylic can duplicate the modification kit. On the other hand, supporting innovators like Jimmy Chen by buying the kit from him encourages Chen and others to continue to innovate. The hobby needs more Jimmy Chens and the hobby should support those like him. 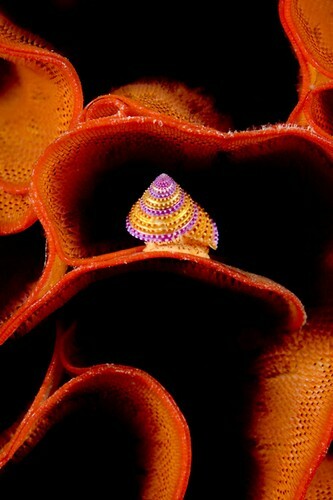 European reef hobbyists and companies once led the way in reef keeping innovation. North American reefkeepers have closed the gap, and these efforts should be encouraged and supported. The most recent evidence that innovation is now flowing from the New World to the Old is the announcement at the recently concluded Interzoo that Tunze will begin producing a new series of nozzle-less pumps for water motion. Seems hobbyists are not the only readers of American on-line discussion groups.